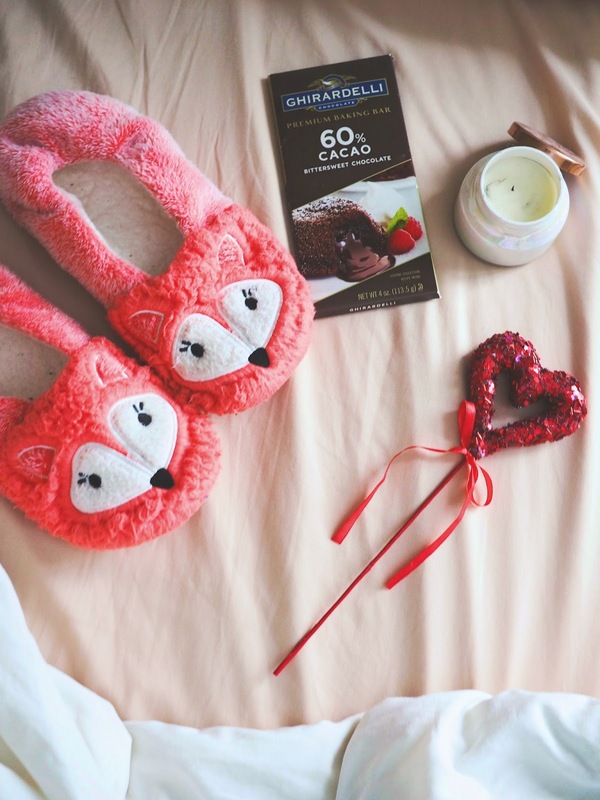 It's February, which means that you're probably going to see a rising amount of chocolate, flowers, and teddy bears being marketed to you. It's the season of love. However, for me, love doesn't necessarily have to be love between significant others, it can also be a great reminder to take some time and appreciate yourself. Just like you would send your significant other a valentine to show your love for them, you deserve the same kind of appreciation. 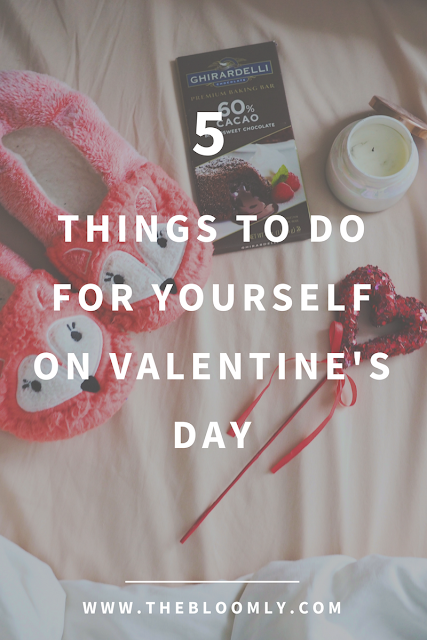 Here are some things that you should do in order to give yourself a little self-appreciation and self-love this Valentine's Day. one. // try something new. There's something that is so rewarding about trying something new that makes it always worth it. In the past, I had been hesitant about trying new things, but as of lately, I've been enjoying it so much more. In fact, the other day I went for my very first yoga class. A friend invited me to go with her and I actually really enjoyed it. This Valentine's Day, I urge you to try out something for yourself, even if it's a little out of your comfort zone, because it can be so personally rewarding. two. // collect compliments and praise. I remember seeing on Twitter someone suggested that people document all of the praise and love that they get on their blogs in a file so that they can revisit it when they're dealing with a difficult time. I thought that it was such an interesting idea since it's the perfect little reminder that you are doing amazingly for those moments when maybe you just want to give up. Regardless of if its for a blog or for your own personal life, try to note compliments (like the really sincere ones) that people say about you and save them. Write them down, put them in a jar, do whatever you can to save them so that you can remember those kind things people said about you. three. // cook a new recipe. Maybe I'm partial to this one because I always enjoy cooking and/or baking, but for me, it can be so therapeutic to spend some time in the kitchen. While you can treat yourself to some self care by trying out a healthy recipe, you can also treat yourself to something indulgent as well, whichever one you would rather do. For some, it's more rewarding to have a cheat day while others it's more rewarding to eat healthy for a change. Cooking something new can be a great way to unplug and focus on the task at hand, while also getting a delicious meal at the end of it. four. // buy one thing that you've been eyeing on. Now, I don't mean that you should go out on a full on shopping spree, just buy one (limit yourself to only one because let's be real, we don't all have the budgets for constant shopping, as much as we would like to) item that you have wanted, maybe for a while. In fact, studies show that shopping and retail therapy can improve your mood. Just like you would appreciate it if your significant other bought you a gift, take some time this Valentine's day and get yourself a tiny little gift. five. // do something you enjoy, just because you want to, not for any ulterior motive. I recently read an article about the importance of leisure on your mental health. I'm not going to share it since it was in another language, but essentially it summarized that spending time doing things you enjoy can immensely increase your well-being, making leisure time very important. In our busy lives, we often choose not to make time for leisure time, instead choosing to spend our free time watching Netflix and browsing social media. Sure, those can be fun, but you should try and carve out time to do something you truly enjoy and is more than just screen time. If it's any motivation, your mental state will thank you if you do.